Whether or not we like to admit it, bullying happens in one form or another in all educational settings. With the negative long and short-term effects felt by all learners – be they victims, bystanders or even the bullies themselves – it’s important to try and create an open and honest environment in which they can discuss their feelings. As such, we’ve hand-picked a selection of our favourite resources to help students of all ages to stand up to bullying in school. For even more inspiration, check out our friendship post for younger learners and anti-bullying post for older students. Spread an awareness of bullying in school and explore a variety of ways to deal with it using this easily-adaptable assembly. Alternatively, prompt students to consider the different forms that bullying can take and the way it can make others feel, before designing an anti-bullying poster with this thought-provoking work book. This colourful presentation not only gets learners thinking about the qualities of a friend, but can also be used as the stimulus for a writing task back in the classroom. This resource is for Upper KS1 and KS2. It consists of a wordbank with words related to bullying and worksheets for the children to discuss with each other or as a class and then write their own feelings and opinions on bullying. They also have to design an antibullying poster. I have also included a powerpoint presentation for classroom use during Talking and Listening time. Explore learners’ understanding of what bullying is and the role of the bystander with the help of these well-structured lessons, which also explore the differences between bullying and conflict. Further re-inforce what behaviour is and isn’t acceptable with this differentiated lesson, complete with scenarios to discuss. Unfortunately rumours are an almost inevitable part of school life. Focus on the impact they can have on individuals and make older students think twice about spreading hurtful gossip with this succinct presentation. Suitable for Key Stage 2 or lower Key Stage 3, two lesson plans with accompanying resources to explore children’s understanding of bullying, differentiate between bullying and conflict and explore the role of the bystander. PSHE or Tutor Time anti-bullying week resources. 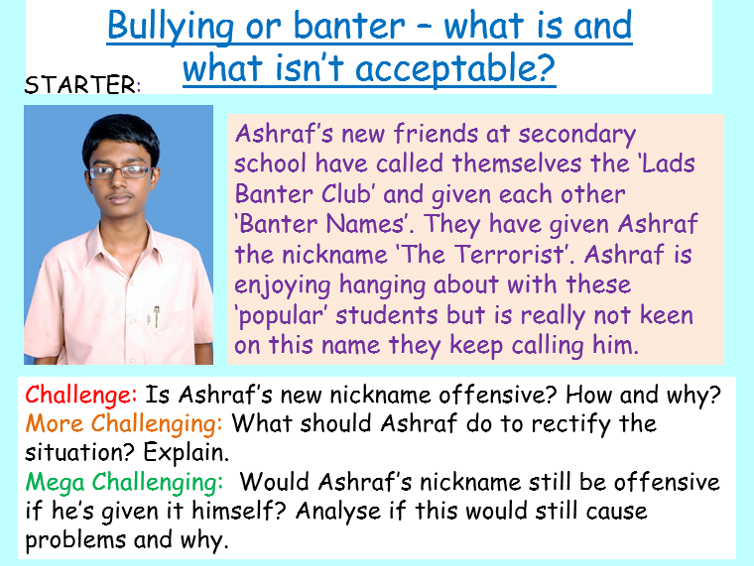 This detailed lesson focuses on the issues surrounding 'banter' culture - and when a bit of light teasing becomes bullying, through investigating case studies and different scenarios familiar to all schools. 1 hour PP, worksheets, clips, well differentiated, KS3/ KS4. These resources have been designed to be engaging, detailed and easy to follow. All our resources are editable (so easy to adapt for your classes) and are designed to last one hour each. If you like this, we also provide a complete KS3 PSHE Package for schools. You can find that here.Complete KS3 PSHE Pack for 7, 8, 9. Resource focusses on how rumours affect people. Includes useful story of how Socrates dealt with vicious rumours. Great for tutor time, assemblies and Citizenship.